HOLIDAY HOMES, HOUSES & COTTAGES TO RENT IN WILTSHIRE, ENGLAND. Welcome to our selection of holiday homes to rent in Wiltshire, England. Wiltshire is probably one of the most beautiful counties in England rich with the history of its Neolithic monuments of Stonehenge, Avebury Henge, and the Cherhill White Horse. The Salisbury Plain is a plateau abound with chalk hills, which occupy two thirds of this county that was once named after the ancient town of Wilton. Salisbury is the only city with one of the tallest cathedrals in Britain. It was built in the 13th century and contains the Magna Carta 1215 agreement between King John and the feudal lords who were prepared to settle it with Civil War if this agreement had not been reached. It is open daily throughout the year with Sunday times for visitors starting at noon. Visits to Stonehenge are also open throughout the year barring the Christmas period and New Year. More time is given to visitors in the longer daylight hours during the summer. This monument is owned by the Crown but ran by English Heritage. Avebury is another stunning Neolithic monument ran by the National Trust and times for visiting can be organised with them. Both are World Heritage Sites and are aged from approximately 2,500 BC. Another fascinating site much younger than its stone counterparts and visible from the sky is the Cherhill White Horse that was erected in 1845. There are many balloon rides held in Wiltshire which will give you a wonderful bird�s eye view of the mounds, barrows and stone monuments carved and built into the undulating chalk hills. These can also be viewed by helicopter. These are more expensive than the normal tour guides of being on foot but they do give the opportunity for a better perspective to the heritage and wonder of Wiltshire. There are also many gardens, parks; and many museums dedicated to military as well as pre-historical. 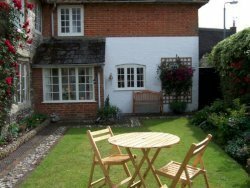 Looking for self catering holiday accommodation in Wiltshire, then below is a selection of houses, holiday homes, flats and holiday cottages in Wiltshire that can be rented direct from their owners. You can either click on each listing for further details or you can use our search engine on the left if you are looking for something in particular.